Azerbaijan's current European Champion and Bocskai Memorial Tournament winner, 18-year-old Teymur Mammadov opened with an impressive victory against Central American and Caribbean Games silver medallist Anderson Emmanuel from Barbados. The Azeri teenager won the bout 23:7 and will now meet Hungary's two-time European Championships bronze medallist Jozsef Darmos. Another local boxer, AIBA Youth World Champion and current European Elite Champion, 17-year-old Salman Alizada made his debut as top seed in front of the home crowd. The Azeri teenager only won one frame in the contest but this was enough to outscore Morocco's African Championships silver medallist Abdelali Daraa and win 16:12. China's Beijing Olympic Games winner and two-time AIBA World Champion, 30-year-old Zou Shiming following his good start in the competition day, triumphed over Hungary's European Championships bronze medallist Istvan Ungvari 12:2 and secured his place in the last 16 in Baku. Ireland's European Champion and Commonwealth Games winner Patrick Barnes from Belfast also made his debut in Baku but he was bowed out 12:20 against Philippines' new 18-year-old sensation, Sydney Jackson Memorial Tournament winner Mark Anthony Barriga. The Irish light flyweight star also last his first bout at the 2009 edition of the AIBA World Championships in Milan. Mongolia's defending AIBA World Champion Purevdorj Serdamba had some unexpected losses in recent years but performed well in his opening contest in Baku, triumphing over Cameroon's All Africa Games winner and AIBA President's Cup silver medallist Willy Thomas Essomba 11:6. England's bantamweight favourite, 24-year-old former European Champion Luke Campbell, had lost only one contest in the last fifteen month and made it look easy on his way to the last 16, dismantling Romania's European Championships bronze medallist Razvan Nicolae Andreiana by an impressive 17:7. Uzbekistan's 24-year-old AIBA President's Cup winner Orzubek Shaymov and Venezuela's South American Games winner Angel Rodriguez put on a top quality boxing show in Baku. The Uzbek boxer managed to keep a slender advance to progress while another Central Asian boxer, Tajikistan's current Asian Champion Anvar Yunusov stopped Turkey's Beijing Olympian Furkan Memis Ulas after 60 seconds. Russia's former AIBA World Champion and Beijing Olympian, 24-year-old Sergey Vodopyanov also advanced to the last 16 in the bantamweight category after beating Colombia's Deivis Julio 26:13. Vodopyanov will now fight China's Asian Games silver medallist Zhang Jiawei for the Olympic quota. Cuba's AIBA Cadet World Championships silver medallist, rising star Lazaro Alvarez shocked the German nation when he triumphed over European Champion Denis Makarov 13:8, he will now meet Italy's Vittorio Parrinello in the next round. Azerbaijan's 19-year-old Youth Olympic Games silver medallist and former AIBA Cadet World Champion Elvin Isayev tried his best against Tajikistan's Asian Championships bronze medallist Madadi Nagzibekov but was unable to secure his place in the next round. The final verdict of their lightweight contest was 23:15 to Nagzibekov who will now meet Hungary's Miklos Varga for Olympic qualification. Ukraine's Beijing Olympic Games gold medallist, Val Barker trophy winner and defending AIBA World Champion, Vasyl Lomachenko had an unexpectedly close fight with 19-year-old US National Olympic Trials winner Jose Ramirez. The Ukrainian superpower led only 5:3 after the first round but had the know-how to defeat his talented US rival 16:9. Kazakhstan's two-time National Champion and Great Silk Road Tournament winner Gani Zhailauov has been involved with his national team for two years now and also competed at the last edition of the AIBA World Championships in Milan. The Central Asian boxer dominated his fight against Latvia's 22-year-old Artjoms Ramlavs and advanced to the next round where he will face Mongolia's Javkhlan Bariadi. In the middleweight category, Asian Championship bronze medallist Ryota Murata of Japan last week eliminated two-time AIBA World Champion Abbos Atoev of Uzbekistan and he continued his winning streak by defeating Iran's two-time Asian Games bronze medallist Mohammad Sattarpour. The final score read 22:11 to Murata who will now be fighting Germany's Stefan Hartel for the Olympic quota. Ireland's European Championships silver medallist Darren O'Neill had tough moments against Egypt's AIBA World Championships bronze medallist veteran Mohamed Hikal in the middleweight category. The Irish star had only one point advantage coming into the last round but succeeded in a narrow 15:13 win. England's Commonwealth Games silver medallist and former AIBA Cadet World Champion Anthony Ogogo had a hard battle against Russia's European Champion Artem Chebotarev. Both boxers are world class performers at this level but only one could advance with Ogogo just edging it 12:11. Top favourite, Cuba's Beijing Olympic Games silver medallist Emilio Correa won his middleweight contest against Austria's Arbi Chakaev. Bulgaria's two-time European Championships silver medallist Tervel Pulev had enough experience to beat Uzbekistan's rising star, 19-year-old Mirzohidjon Abdullaev in their heavyweight contest. The final verdict of the bout was 9:7 to Pulev. His next opponent will be Ukraine's gold medal contender in the heavyweight category, European Champion Oleksandr Usyk who overwhelmed Lithuania's Eugenijus Tutkus 26:2. 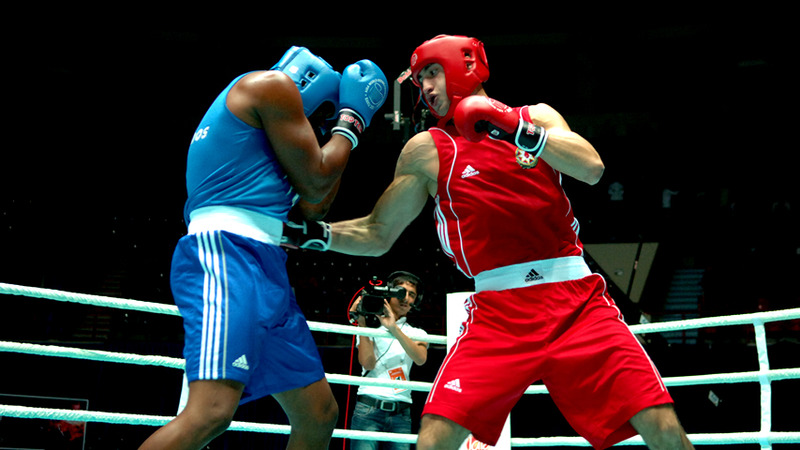 Following two rounds of preliminaries, 160 boxers from 47 nations can still dream of reaching the 2012 London Olympic Games. Cuba and China lead the team rankings with both nations having eight boxers each in the last 16. The other top nations, Russia, Ukraine, Kazakhstan and Ireland each have seven athletes left. Hosts Azerbaijan, England, Germany, Italy and the United States have six competitors representing them in the last 16 with while Uzbekistan, India, Mongolia and Hungary have five fighters remaining in Baku.